Love gives me hope, passion gives me motive and travel supplies the oxygen to keep me going. I was travelling with my troop back to Leh from Nubra Valley, it was quite a cool June morning. With rain and breeze, the weather had changed overnight. We were going to cross Khardung La once again. Looking forward to play with snow and sipping hot chai at Rinchen Cafe, I was ecstatic. We all had made strategies on how to win in the snow fight. 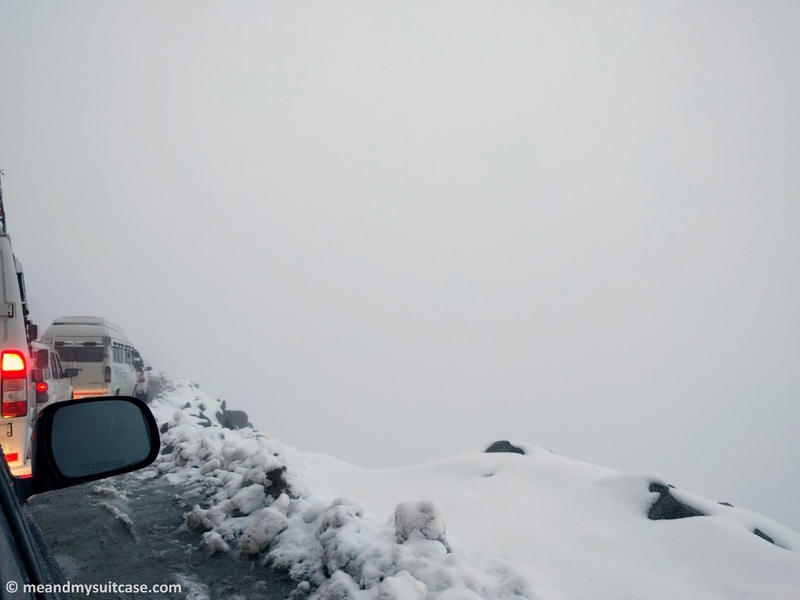 "Here you people, we are now crossing Khardung La", said Tundup, our driver. "Whoa!" My buddies and I said in unison. I was blinded by the true white, thick bed of snow. As far as I could see it was only white, the vehicles parked on the snow bed and the humans in their colorful jackets were all appearing as colorful saplings and flowers ready to branch out. It was 1000 hours and we were stuck in the traffic jam, "Already? ", questioned my mind. Cars and bikes lined up empty, Passengers forgetting about the jam were all out enjoying the snow. We too jumped out of our SUV and as planned started with the snow fight but neither team could last for more than 5 minutes. 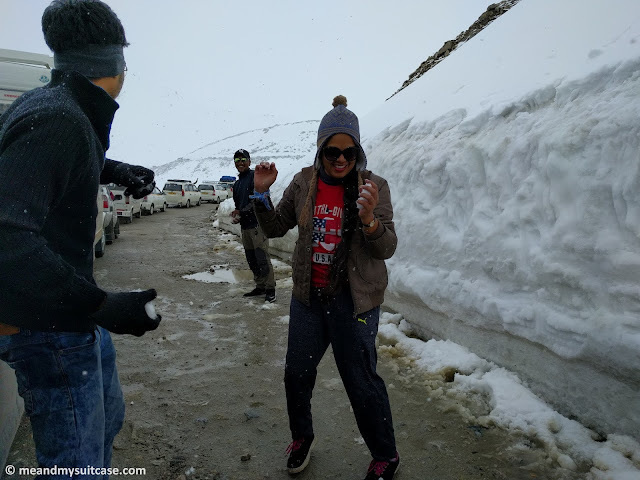 Every time we fought for 5 minutes we had to take rest for next 10 minutes and had to warm us up because Oxygen is scarce at Khardung La, the highest motorable pass in the world (It is not advisable to indulge in much physical activity there since air is thin. Also, take precautions to tackle Altitude Sickness). Snow fall started soon. Snowflakes on my face felt magical. We were already stuck in that jam for 4 hours but nothing could dampen my spirits. I love snow & the mountains and I was encompassed by them. It was a feeling of heaven on Earth. But then soon time started to take tall on all of us, hours had passed and we wondered when will we move further. Crawling bit by bit as BRO kept cleaning the way off snow, we reached Khardung La Top. Rinchen cafe right in front of us, "Could it get any better", I thought. But we were so tired, it was 1700 hours now and 5 inches thick snow to walk on. Rinchen was flooded with people, so we got our tea and came back to the car but not before I got my picture at the cafe. It seemed as if Temperature and Oxygen were competing with each other, dropping every passing hour. Back in car we kept praying for jam to get cleared. When the trip had started I was dying to see snow but I certainly did not want to die of snow, it was a struggle between the two cerebral of my brain, one wanted to leave as soon as possible while the other still couldn't get enough of the adventure. Uneasiness was creeping in due to less oxygen but with the efforts of BRO jawans (soldiers) the roads were cleared enough for vehicles to march out. It was 2000 hours when we started crawling back to our abode. As we crossed, I couldn't help but notice many abandoned motorbikes, the riders had left them there and hitchhiked with the bigger vehicles to the city. On inquiring more, Tundup said that they will be taken back later and it is a regular sight in such weather as bikes are more prone to skidding. One we had experienced during the day when one bike lost control and had bumped in to the bumper of our SUV. The night still did not feel like night. It was eight yet so white, I was amazed by all this. "Oh! You did it", said my mind. I had survived the harsh weather, it must be the blessing of the beauty of nature I was always determined to see. It was no bungee jumping or sky diving but an unplanned adventure. 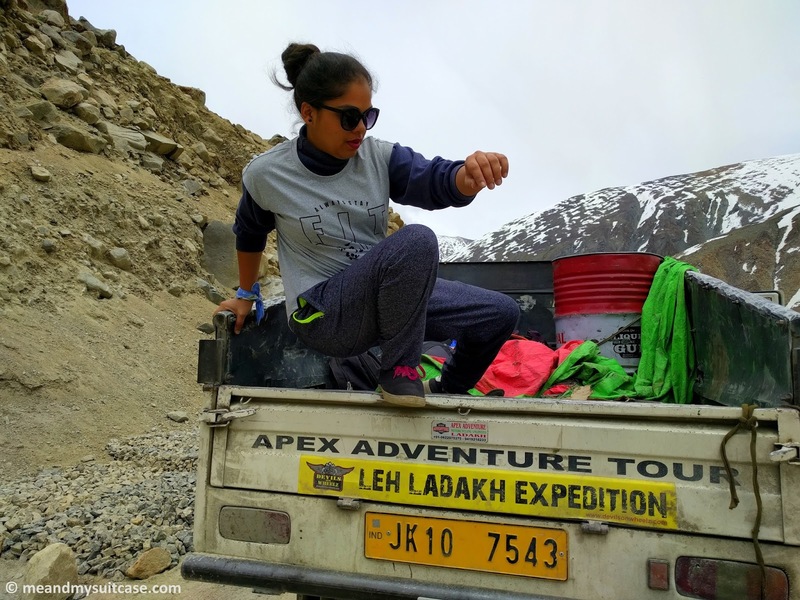 It was my love for life aka travel which gave me hope and that's how I spent 10 hours stuck at Khardung La and lived to tell the tale. Just that you know, it is not recommended to spend more than 20 minutes at Khardung La and we stayed for 10 hours. So it is better to be prepared. Take necessary precautions for Altitude Sickness, keep some food stock with you while travelling at such places and it goes without saying that you definitely need to keep fit, mentally and physically. It's not for faint hearted. Crossing the Khardung La is an experience in itself. I can imagine getting stuck there for so long! Loved reading your experience. Brought back fond memories. Ladakh is long due and such experience or may be unplanned adventures thrills me. Although can understand the plight of the person who gets stuck midway.. but in the end it all becomes memories ! Whoa. That's quite an adventure..I am glad you emerged unharmed. We were not allowed to spend more than 30 minutes here. What an adventure Di! May you get to experience more, very nicely articulated.